So what BBQ thermometer is the best? What is a BBQ Meat Thermometer? Why are BBQ Meat Thermometers Used? When barbequing it is important that correct temperatures are kept to ensure your meat of choice is cooked to perfection. The use of a meat thermometer, temperature probe or guage is highly recommended to measure both the temperature within the bbq and also the internal temperature of your meat. In this article we will review a range of temperature probes and guages readily available on the market today. Matt, Owner of Bigwig Jerky Co.
Great unit at a great price! 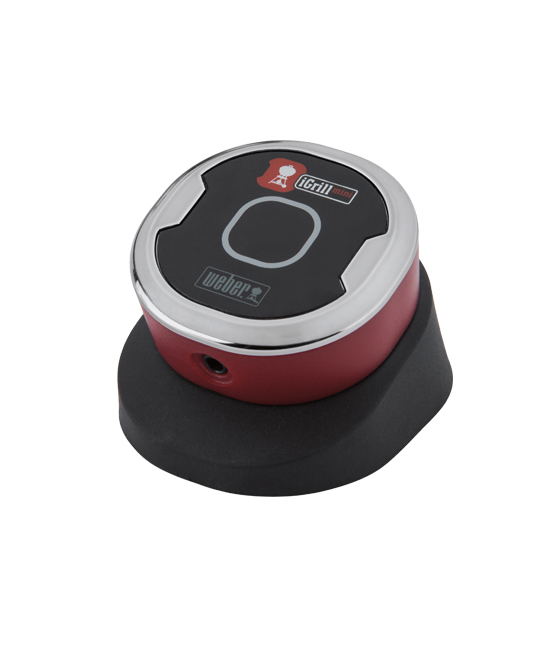 Take full control of your bbq with 6 probes and bluetooth 50m/150 foot wireless range to your smartphone. This simple to use unit can display in both Centigrade or Fahrenheit with a temperature range of 0~300°C / 0~572°F (continuously monitoring). The 6 probes makes monitoring multiple meat temps a breeze along with temps throughout different locations of your BBQ/smoker. Overall a great little device you can’t look past especially at the current price. Grab one today and try it for yourself. One of the most popular BBQ thermometers! If you have done your research you would have read a lot about the ET-733. It has been the most popular choice among BBQ teams and home cooks for a long time. There are many reviews on BBQ forums and the majority positive. The dual probes allow you to monitor both the bbq temp and your food at once. The probe wires are a good length at 91cm and are rated to 380F. There are many stores online that stock replacement probes, so if you ever have an issues, it’s not hard to get new ones. The ET-733 comes with 15 Presets. 6 preset temperatures for Beef, Veal, Lamb, Pork, Chicken and Turkey and 9 BONUS preset temps and it stores settings even when the unit is off. Overall a very popular device used by pros and home BBQ enthusiasts. Definitely worth a try. Grill with ease knowing you won’t be overcooking! This smart little bluetooth thermometer really gives the iGrill devices a run for it’s money. Alerts from the app when your meat is ready will allow you to chill out and roam around rather than babysitting your meat hours on end. The ET-735 also supports up to four probes and has a 160 foot range, so again very similar specs to the iGrill. The temp range though starts at 32 and goes up to 572 degress fahrenheight. The good thing about the probes are they are waterproof, so cleaning is made easy, but like many probes they are very delicate, so do take care. Additional probes can be purchased. Overall this device has very similar specs to the iGrill. The app has many features and is easily downloaded from your device app store. The iChef is powered by 2 x AAA but you will need a very small phillips head screwdriver to access them. This is a great unit! 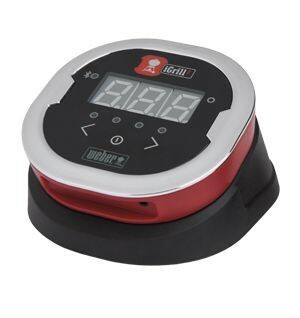 The ability to monitor up to four separate temperatures simultaneously is definately a great advantage over other devices and makes grilling so much easier. Being a Weber product brings with it that added comfort of a using a quality product with great service and support. The unit comes with 2 probes so you can get cooking straight away, and the free Weber app can be downloaded easily from iTunes and Google Play. The iGrill2 is also capable of a wider temperature range than cheaper products on the market, with ranges from -22 to 572 degrees fahrenheight, you will have no issues getting the desired temp. It’s impressive wireless range of 150 feet allows you to cruise around the house or pool area and still be able to monitor your temps, so put your feet up grab a beer and settle in and watch the footy while monitoring your temps at the same time. Overall the product has a pleasant, smart looking design and more importantly is easy to use. Autoshutdown will keep your batteries lasting longer, and the ability to extend to four probes is definately a major selling point! Food and Shelter are among the basic needs of human beings. They have always tried their best to improve both these basic needs. They have employed different tools and techniques to fulfill their demands. They have also changed their ways of living and eating. Nowadays, processed foods have become very common all across the globe. This is because they save our time and energy. Different tools and techniques are being used to improve the taste and aroma of the food. Earlier, there were no cooking tools and people used to cook food for an estimated time. Later, humans realized that overcooked food showed negative effects on the health. Therefore, they started using tools to check the temperature of the food. A BBQ thermometer is the tool to monitor the temperature of the food that is being processed. In other words we can say that it is the tool which really tells us what is happening inside the processor. Nowadays, these thermometers are considered as necessary for food processing as forks and knives are considered important. There is an alarm in these thermometers which warns the user when the food is cooked. It minimizes the chances of overcooking. The research has proved that millions of people across the world die of eating overcooked foods. With every passing day, their importance is increasing as people are becoming more conscious of eating fairly cooked food. It is a scientific fact that the meat we eat consists of about 75% of water. Cooking meat at an estimated temperature without any thermometer may destroy the nutritional contents in it. This means that in order to enjoy the real taste of the meat, we should cook it at such a temperature and time that one third of water should be present in it. This not only increases the taste of the food but also maintains its nutritional benefits. Thus, BBQ thermometers are used to retain the taste and nutritional benefits of the food. The research has proved that meat causes illness until it is cooked at some specific temperature. To do so we use BBQ thermometers of various kinds that have different temperature limits to show. Following are the main kinds of BBQ thermometers that are being used all across the globe. This is the most commonly used BBQ thermometer which gives an extreme accuracy in showing temperature of the meat. It has a probe to get into the center of the large piece of meat. This thermometer is water proof and can be used at any place without any fear. It is fast enough that it shows the temperature within two seconds. This thermometer has also the options to check temperature both in Fahrenheit and Celsius scales. It was first introduced in 2015 and so far it has passed through many improvements. It can show the temperature ranging between -58 and 572 degree Fahrenheit and -50 to 300 degree centigrade. It usually has a large display to show the temperature and this display can rotate as the device rotates. 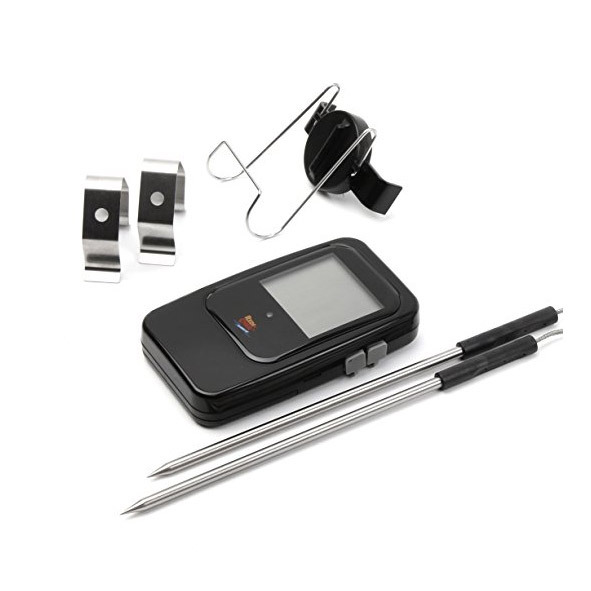 This is another very small and easy to use BBQ thermometer which also has a clip for keeping it in the pocket. It has a probe of about 4.5 inches which can sense the temperature in just 6 seconds. Its display is also easy to rotate and is convertible to Fahrenheit and Celsius scales. It is also equipped with a backlight which automatically turns off with the temperature display. This thermometer was invented in 2013 and has now become splash proof. It can also show the temperature between -58 and 572 degree Fahrenheit. 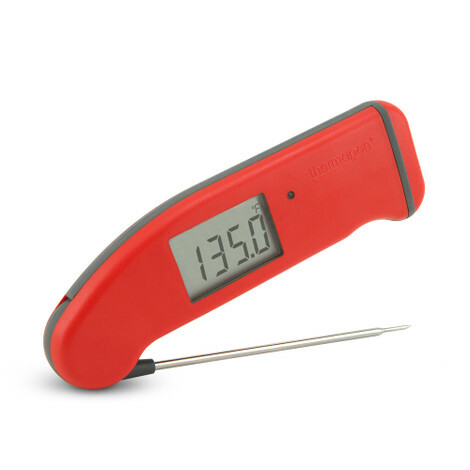 This is another very nice and accurate thermometer that comes with a sleek probe and a Meat temperature magnet. It has the ability to measure the temperature in just 6 seconds with high degree of accuracy. If the probe is covered, it becomes waterproof. It can also measure the temperature from -58 to 572 degree Fahrenheit. This is also a very good BBQ thermometer with an alarm. It means that you can leave the kitchen until the alarm rings. Its accuracy is a little lesser than other BBQ thermometers. There may be a difference of 1.8 degree Fahrenheit. There is also a long probe with it that can resist the temperature of 700 degree Fahrenheit. It can also be used an instant read thermometer because its probe is too much sleek and can go the center of a large meat piece. The alarm can either be set at low or high temperatures. 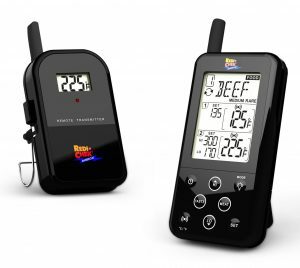 These are the modern BBQ thermometers that are very easy to use and monitor. 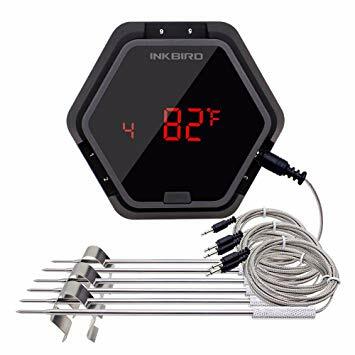 These have two probes that can be inserted in the meat or one in the meat and the other in oven, grill, or smoker a good example is the Inkbird IBT-4XS. There is a transmitter and receiver module in this BBQ thermometer. You can take the receiver module with you in your living room. When the temperature limit is reached or cooking is done the transmitter sends the radio signals on the receiver module and you can see on the display what is happening in the kitchen. It has the ability to measure the temperature in just a few seconds. As the name suggests, this BBQ thermometer is in the form of a little gun that works with the help of infra-red rays. For obtaining accurate results, it should always be used on dark surfaces because the shininess of stainless steel surfaces may lead it to give inaccurate temperatures. This thermometer also comes with meat temperature guide magnet and can measure the temperature up to 1022 degree Fahrenheit. There are a lot of benefits of BBQ thermometers and, therefore, their use is increasing with the passage of time. Following are the main benefits of using these thermometers. BBQ thermometers are useful in the remedy of food borne illness. This illness unknowingly kills a lot of people every year in almost all the countries of the world. Food borne illness is created either by overcooked food or less cooked food. BBQ thermometers are a good solution to this problem because these prevent the overcooking and less cooking of food. It helps in cooking meat at some specified temperature for some specific time thus retaining the nutritional contents in it. Different temperatures are set for cooking different kinds of meat. This kills the harmful bacteria present in it and removes the danger of food borne illness. Chicken is usually cooked at 160 degree centigrade, while beef and lamb are cooked at about 145 degree centigrade. Overcooking had remained a major issue until the invention of meat thermometers. People used to check the cooked meat through either touch or color. Overcooked meat loses much water content in it and becomes tough and dry. This toughness also affects the taste of the meat. The BBQ thermometers have proved a lot beneficial in this regard. These not only help to cook the food at proper temperature but also retain the nutritional contents in it. The meat cooked through using BBQ thermometer usually remains soft and juicy and full of nutritional benefits. The use of BBQ thermometer eliminates the guessing done for cooking meat. There may be a possibility that two pieces of meat do not cook at the same time. Because guessing involves time for cooking and it may vary for two pieces. Using BBQ thermometer, we can cook all the meat at the same time through maintaining a constant temperature. BBQ thermometers have also proved useful in food serving. This is because you can check the temperature of meat before serving. The meat which becomes cool has bacteria residing on it. Moreover, the food with good temperature is rich in taste and smell. BBQ thermometers have also gained importance in reheating the food. Using these thermometers food is reheated at the suitable temperature which maintains its softness and nutritional contents. Never leave them in the rain. Avoid dropping them as the display may break. Also try to use it within temperature ranges. Never smash the cable because it may break from inside and you may not know the problem. Always keep the probes clean and dry because these may fail. It is even better to purchase some extra probes to avoid any difficulty. Regularly clean the probe as carbon may build up at the tips. Also clean the rest of the parts regularly. Try to store these in their proper packages when not in use. Combining the above tips and the information from our post on how to use a bbq thermometer, hopefully this will be enough for you to confidently start barbecuing using a meat thermometer. Bigwigjerky.com.au is a participant in the Amazon Services LLC Associates Program, an affiliate advertising program designed to provide a means for sites to earn advertising fees by advertising and linking to Amazon.com.au. 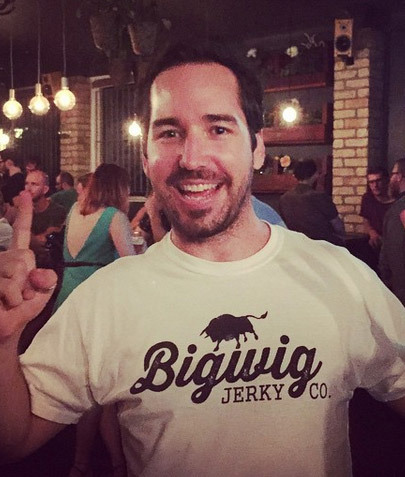 Additionally, Bigwigjerky.com.au participates in various other affiliate programs, and we sometimes get a commission through purchases made through our links.